Musical Theatre News: X Factor Musical Renamed I Can't Sing! X Factor Musical Renamed I Can't Sing! The new X Factor Musical which had the working title X Factor - It's Time to Face the Musical has now been named I Can't Sing! after one of the funniest songs in the show. It will open at the London Palladium on 26th March 2014 (previews from 27th February). Preview tickets are on sale from 10:00 am tomorrow. 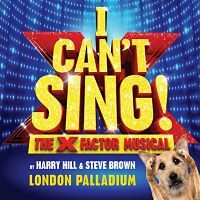 Simon Cowell, whose company Syco Entertainment is co-producing the show with Stage Entertainment, told the Standard: "We’d been umm-ing and ahh-ing about the title for a while, then it hit us - there’s never been a musical called I Can't Sing!" It features a singing hunchback and talking dog telling the story of Chenice. She lives in an ITV blackspot because her Grandad's iron lung interferes with the signal in her caravan, and is only girl in the world who has never heard of The X Factor. When she accidentally stumbles into the audition queue with her talking dog, she starts a journey to both stardom and love. Along the way she is joined by contestants with vastly varying degrees of ability, some judges you might well recognise and Max, a handsome ukulele playing plumber and part time eco-warrior.